~Fabelle Societe De Chocolat: A Participative Masterclass in chocolate learning~ Delhi, November 2017: Fabelle, a one of a kind, home grown luxury chocolate brand is revolutionizing the understanding of luxury chocolates by championing participative and immersive experiences in the country. Fabelle master chocolatiers specially create these participative luxury experiences in the chocolate boutiques based in ITC’s super premium luxury hotels at the live chocolate studios in which consumers can interact with chocolatiers, observe live chocolate making and create chocolates creations as per their tastes and preferences. 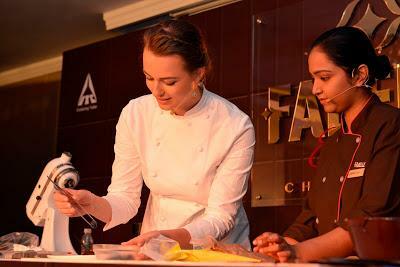 Taking these uniquely crafted experiences further, Fabelle’s Societe De Chocolat is being launched which is a dedicated series of masterclass which aspires to foster love for chocolates and introduce the nuances of making and appreciating luxury chocolates to the Indian consumer. 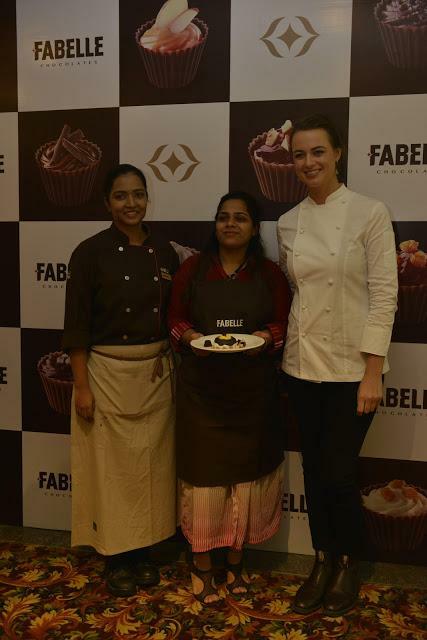 Since its launch, Fabelle has witnessed a surge in consumer enthusiasm to understand the different aspects of chocolates. While interacting with consumers at the chocolate boutiques, Fabelle Master Chocolatiers have gained insights that the consumers were extremely intrigued by various origins of cocoa, different cocoa flavor notes, techniques involved in chocolate making like tempering and conching and were keen to understand how exquisite chocolate creations and desserts are crafted et al. They also recognised the sense of gratification that consumers felt when they were involved in the process of the chocolate making and participated in this journey. Banking upon this consumer enthusiasm & inquisitiveness, Fabelle’s Societe De Chocolat masterclass series has been introduced at all chocolate boutiques. Societe De Chocolat is an exclusive chocolate making program which is designed to create better understanding of chocolates to consumers and provide rich insights into the art of chocolate making. From understanding the origins of cocoa to melting and tempering the chocolate, making chocolate to plating and serving the creations the program aims to address all the intricate facets of chocolate making. Fabelle’s Societe De Chocolat has been in session for last six months and these classes have already been well received by the consumers including even children. Fabelle now plans to conduct special masterclasses with well know international experts for the emerging chocolate connoisseurs in the country. 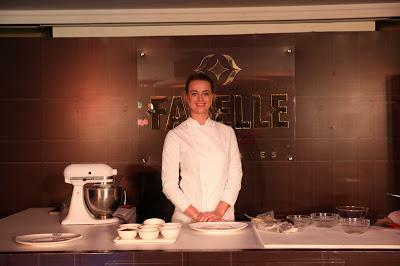 In a first such initiative, Fabelle collaborated with Billie McKay, winner of Masterchef Australia 2015, as their first global mentor for Societe De Chocolat masterclasses. She along with Fabelle master chocolatiers hosted a series of 4 masterclasses and brought to life some of Australia’s most iconic desserts using Fabelle chocolates like the quintessential Ice-Cream Sandwich with Master Chocolatier Ruby, in ITC Gardenia; The Lamington with Master Chocolatier Bhumika, in ITC Maratha; The inimitable Pavlova with Master Chocolatier Sreyoshi, in ITC Maurya and The Chocolate Ripple Cake with Master Chocolatier Deepthi, in ITC Chola. The event also saw Fabelle Master Chocolatiers introducing the audience to various types of cocoas used in the recreations of desserts, demonstrated key steps in processing the chocolates and various techniques involved in making the exquisite desserts. Billiealso shared some tips and tricks and explained how different chocolates could be used to make simple in home chocolate creations which was well appreciated by guests. This was followed by an interactive session between the audience and the celebrity chef, where Billieinteracted with the guests and responded to their queries. With this initiative, Fabelle continues to establish itself as the true pioneer of luxury chocolates in India by further strengthening one of the brands core propositions, that of providing active and participative luxury. Speaking at the event, Mr. Dipak Haksar, Chief Executive, ITC Hotels & Welcome Hotels said, “The introduction of Fabelle’s Societe De Chocolat masterclass series further underscores ITC Hotels’ endeavours in providing immersive experiences that are unique and can be cherished by those who indulge in it. This collaborative effort with Masterchef Australia Winner 2015, Billie McKay is part of our objective to transform the art of chocolate making into a multi sensorial affair.” According toBillie McKay, Celebrity Chef & Winner of Master Chef Australia, 2015 – “Creating distinctive experiences is in itself an innovation and a step towards being unique and Fabelle as a brand champions that. I have always thought that a memorable experience comes with the urge to create something for yourself, by yourself. With Fabelle, one really gets the opportunity to discover their passion for chocolates and that is why my association the brand is so very special. Luxury has always been an end product and seldom do we get an opportunity to experience the creation. This has now been transformed by Fabelle into an active and participatory experience.” According toManish Bhasin, Executive Chef at ITC Maurya – “Chocolate has always been a passion of mine. The different textures and parings that come together to create a symphony of flavours is a unique experience, one that Fabelle proudly advocates. At Fabelle we are all about creating an immersive experience for our consumers. With Fabelle Societe De Chocolat masterclasses, the brand once again presents its consumers an opportunity to interact and learn the technique of fine chocolate making and appreciation. Fabelle Societe De Chocolat is a two way, interactive master-class, allowing the consumer to innovate and communicate ideas leading to an unparalleled experience”. FabelleSociete De Chocolat classes are conducted by their highly skilled Master Chocolatiers, in the setting of their luxury boutiques in select ITC hotels across the country and the classes have already been well received by consumers across markets. Extending the Societe De Chocolat initiative, Fabelle has now opened its doors to different sets of chocolate lovers like children, mothers and kids, corporates etc in which the learning content is tailormade as per requirements. With the enduring Namaste as the symbol of its brand experience, ITC Hotels is one of India’s largest luxury hotel chains, operating under four distinct brands that offer comprehensive hospitality solutions through more than 100 hotels in over 70 destinations in the country.